The Malaysian Department of Wildlife and National Parks set up the National Elephant Conservation Centre at Kuala Gandah in 1974. The conservation effort is located within the Krau Wildlife Game Reserve in Lachang, Pahang and is easily accessible via a one and half drive from Kuala Lumpur. The elephant sanctuary at Kuala Gandah is the only one of its kind in Malaysia. The sanctuary aims to protect and rehabilitate the Malaysian Wild Elephant, which has been designated as a critically endangered species. Only about 1200 elephants remain in the wild on Peninsular Malaysia today. Encroachment and logging on their natural habitat are the main causes of the decline in their population and this centre aims to locate orphan elephants and rehabilitate them. 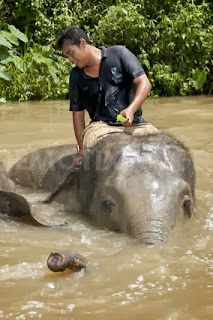 The NEC has in recent years identified, rehabilitated and released more than 700 wild elephants into safe heavens like Taman Negara where contact with humans is limited. · The Kuala Gandah Elephant Conservation Center is located in Lachang, Pahang and can be easily accessed from Kuala Lumpur City by a one and half hour drive. · The sanctuary doesn’t charge any admission fees though you should try and call before you visit, as the center allows a maximum of 120 visitors to observe and interact with the elephants every day. · The center may not levy admission but you are encouraged to donate generously for your funds are sorely needed for the maintenance and upkeep of the centre and the animals. · As soon as you arrive at the sanctuary, you are required to register at the main building. You are then allotted a red or yellow sticker. 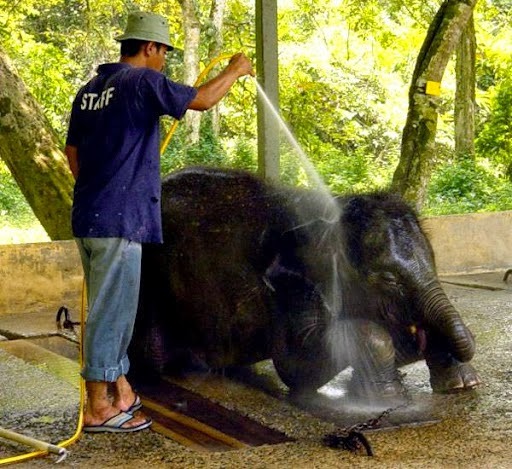 Holders of yellow stickers are only allowed to observe the elephants while holders of red stickers can interact with the elephants by participating in the feeding and bathing rituals of the elephants. Mahouts and caregivers are on hand to ensure that visitors do not disturb the elephants unduly. · The center opens at 10.30 am daily but interactive activities with the elephants are usually scheduled for the afternoon. · Visitors are invited to attend a video presentation on the center’s elephant translocation activity produced by the center in 1996 in conjunction with National Geographic. · A visit to the Kuala Gandah Elephant sanctuary can easily be combined with a visit to Deerland Park located close by. The Deerland Park offers visitors the chance of interacting with animals like deer, sun bears and reptiles like pythons.